When Charles Lindbergh flew across the Atlantic Ocean in May of 1927, he ignited the imaginations of many. 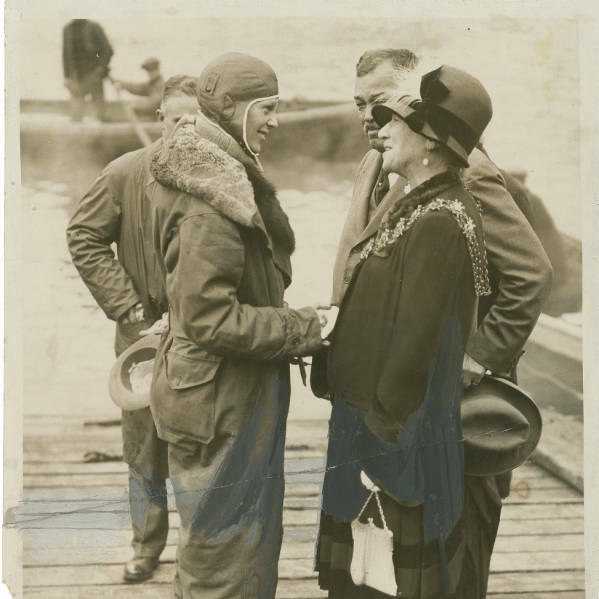 One enthralled by the idea of being the first woman to fly across the Atlantic was Amy Phipps Guest. Amy Phipps was the wife of Frederick Edward Guest, a British politician who served as the Chief Whip of the Coalition Liberal Party from 1917 to 1921 under Prime Minister David Lloyd George. After a little more research, Guest decided the risk was too much for her to fly as a passenger across the Atlantic Ocean. Pilot Wilmer Stultz and copilot Louis Gordon, who would also serve as the mechanic for the flight, made room in the craft for Earhart. At first, Earhart was going to accompany the men merely as a passenger. Earhart took on the responsibility of maintaining the flight log. Friendship and her crew took off from Trepassey Harbor in Newfoundland on June 17, 1928. Over the Atlantic Ocean, the flight operated for the most part in instrument conditions. Because she had no training flying instruments, Earhart did not fly on this trip. Twenty hours and 40 minutes after takeoff, Stultz landed the Fokker near Burry Port in Wales. When Earhart, Stultz, and Gordon returned to the United States, New York City treated the trio to a ticker-tape parade. They were also guests of President Calvin Coolidge at a party in Washington at the White House. Indeed, just under four years later on May 20, 1932, Earhart, then 34, did exactly what she said she might try. In a single engine Lockheed Vega, she struck out for Paris. After flying just shy of 15 hours by four minutes, she landed in a pasture north of Derry, Northern Ireland. Earhart would win the Distinguished Flying Cross for this flight. This entry was posted in Aviation, Aviation History, Flying, History and tagged a suitable girl with “the right image”, a ticker-tape parade, airplanes, airspeed, altitude, Amelia Earhart, Amy Phipps Guest, barnstormers, Captain Hilton H. Railey, Charles Lindbergh, copilot Louis Gordon, discipline, England, flying, Frederick Edward Guest, Friendship Trepassey Harbor Newfoundland Burry Port in Wales, instrument flying, Lockheed Vega, New York City, Pilot Wilmer Stultz, President Calvin Coolidge, publishers, the Atlantic Ocean, the Fokker F.VIIbb/3m, “Like a Sack of Potatoes”, “Maybe someday I’ll try it alone.”, “Would you like to fly the Atlantic?”. Bookmark the permalink. What a great blog! I found it doing research on Hilton H. Railey. My father served with him during WWII and I find him to be quite an interesting character. One minor correction – Railey did not ask Ms. Earhart over the phone if she wanted to fly the Atlantic – he only told her that he was looking for someone interested in participating in “an important but hazardous flight”. He didn’t want to reveal anything more specific until he had met her in person, but she wouldn’t agree to meet him until he had at least stated the general nature of his business (and provided personal references). It was in his office, once he had had a look at her and felt she was a qualified candidate, that he revealed the full nature of the flight. Nathaniel, thanks for the compliment and the correction. I won’t change the copy above, letting readers know “the rest of the story” by way of your comments. What are you doing the research for? When I was a kid I used to ask my dad for war stories – because in the mid-1960’s almost every kid’s dad had served in the war and we always tried to top one another tales of what our dad did during the war (which led to a LOT of BS). One time my dad said, “Tell them I blew up tanks”, and I replied, “Wow! What, with bazookas?” “No”, he replied, “With a Coleman compressor”, and left it at that. Railey wrote an autobiography that was published in 1938, “Touch’d With Madness” – a good read! Not much more about aviation, though, as the 1928 trans-atlantic flight was his only gig involving airplanes. I knew Col. Hilton H. Railey in his later years when he lived in Maine. My father was his physician in Thomaston and later Rockland, Me where he passed away. I used to go with my father on some house calls and met him, I also knew his wife. He was an imposing person, gruff but at the same time he told fastenating stories. I remember stories of Amelia. I read his book “touched with madness” it was interesting and gave more insight into his life story. He sailed on SS Ancon to Panama and that ship became the training ship at Maine Maritime Academy. I sailed on that ship as a midshipman at MMA. Colonel Railey (“Slug”) was married to my mother’s cousin, Buddy. I used to spend time with them in Thomsaton when I was a boy. Big shells standing as momentos of WWII around the house. Gave me a lot of pictures from those days. He was mighty upset when he came to pick me up in Rockland after me & my buddies had gone to a movie. We hopped on the train to return, he arrived & found us on the rear platform waiting to depart, ordered me off the train – & I disobeyed. That did not make him happy. Later, when he was in a wheelchair, I still needed to stay a little clear, since his arms & his hands were still strong enough to (lovingly) shake me silly. Had a military approach to everything, including how he watered the flowers.